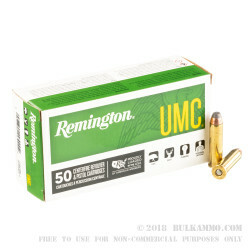 This .357 Magnum ammunition from Remington's UMC division is suited to both hunting and target use. 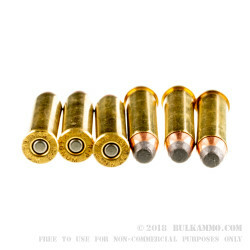 Each cartridge in this box of 50 fires a light 125 grain jacketed soft point bullet at a muzzle velocity of 1,450 feet per second (even faster in carbines). This combination of a light bullet and a high velocity helps the soft point expand for faster kills against medium game. And when hollow points are not an option, this ammo can be used for self-defense as well. Remington UMC ammunition is loaded in Lonoke, Arkansas and uses non-corrosive Boxer primers and brass cases. It is available in a variety of popular calibers and offers a great value for high volume shooters!